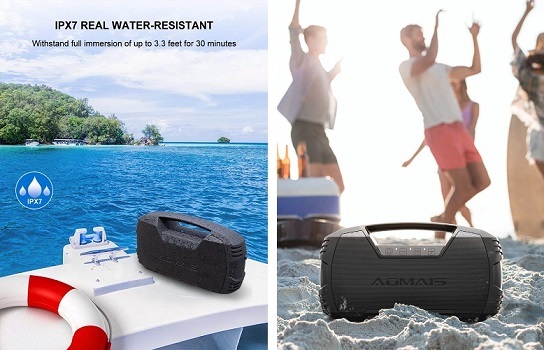 Waterproof Bluetooth speakers offer quality sound with low power consumption and better portability without worrying about the risk of damage from water. 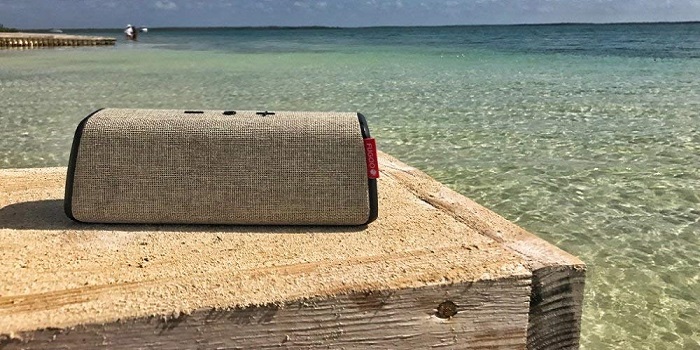 A perfect choice if you like to listen to music when you are in the pool, the beach, or while taking a shower. 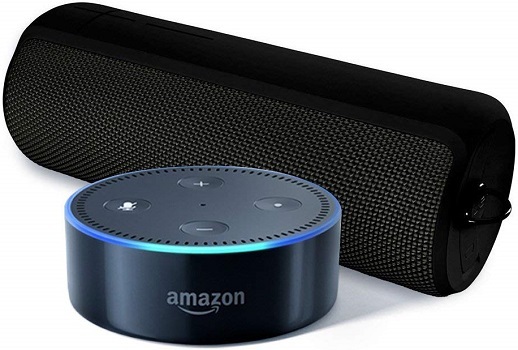 So if you like to enjoy the benefits mentioned above, and looking for the best waterproof Bluetooth speaker, the list below will simplify your search. 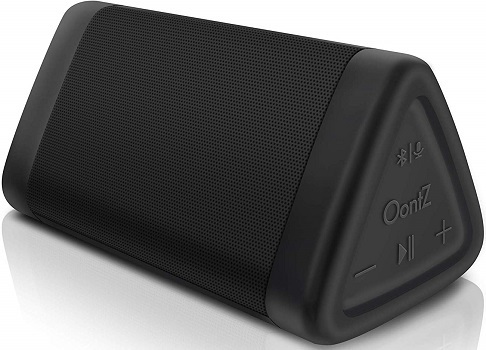 OontZ Angle 3 delivers crystal clear distortion-free sound with surprisingly loud volume. 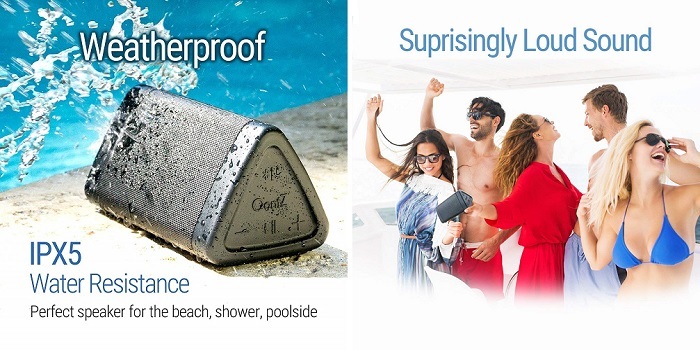 It connects in just a few seconds over Bluetooth with up to 30 feet range to your iPhone, Smartphone, and Tablet so you can listen to music in the shower, the beach, or by the pool. 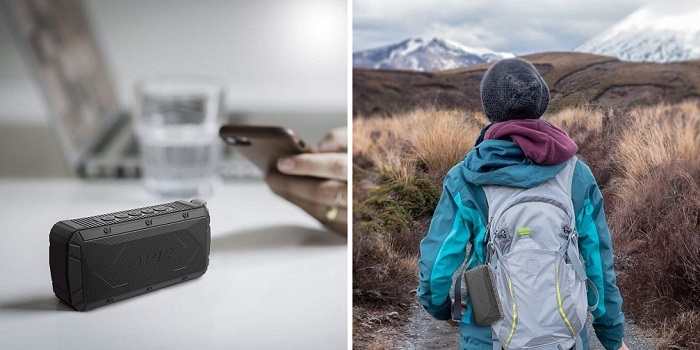 The speaker also works for phone calls from your iPhone and Smartphone. • Durable and well built. • Pairs easily and quickly. • Very easy to setup and use. • Stylish design plays horizontally and stands to play vertically. • No included power adapter. • Bright blue LED indicator light on the front. • The battery life is shorther than its predecessor the OontZ Plus. • Connect over Bluetooth in seconds to: iPhone, iPad, iPod, Mac, Smartphones, Tablets, Laptops, Computers, Chromebooks. 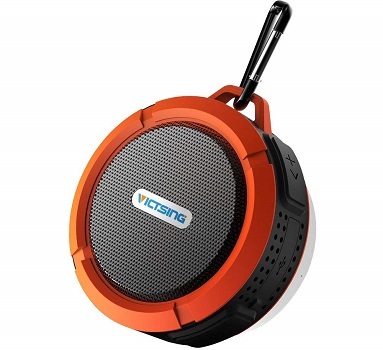 VicTsing Shower Speaker let you enjoy quality stereo experience without the hassle of tangled cable and frees your hands when answering a phone call. It supports any Bluetooth-enabled devices such as iPhone, iPad, HTC and so on), PDA, tablet PC, iPad, Mac Air, MP3 players, PCs, laptops, etc. • Looks and feels tough. • Solid, rugged practical speaker with no bells and whistles. • Reliable suction cup which doesn’t fall off while showering/bathing. • Takes time to turn on. • Not made for large settings or crowds. • Irritating voice navigation whose volume cant be lowered. 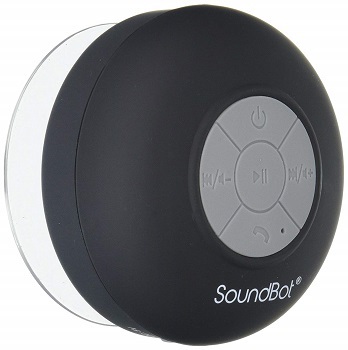 • It has built-in MIC Bluetooth speaker and hands-free function, so you can conveniently pick up a call by this mini speaker in car, bathroom, at home or office, anywhere during it is connected to your Smartphone. 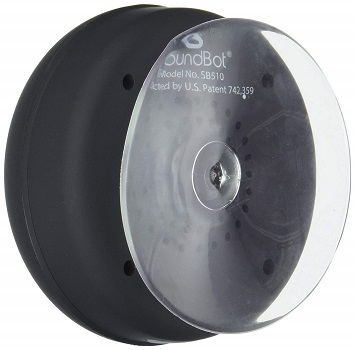 SoundBot SB510 provide universal compatibility with Android and iPhone tablets, smartphones, iPods, MP3, MP4 and other Bluetooth enabled digital players. It delivers premium acoustic sound, crispy high note, crystal clear mid-range, and balanced bass. • Small delay for the sound to start when pressing the "Next" button. 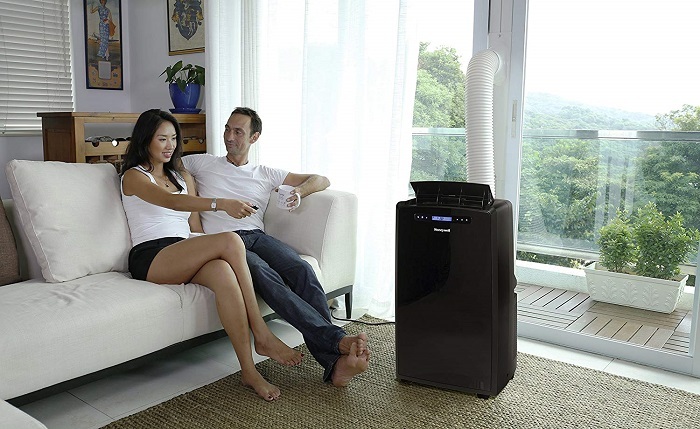 The speaker allows you to enjoy quality stereo sound with a stable connection range up to 33ft. 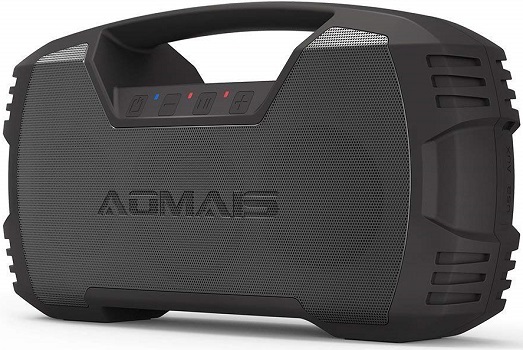 Not only waterproof, AOMIAS SPORT II is made to be one of the toughest Bluetooth speakers. Its resiliency enables even a car to go over it without any damage in sight. To protect your investment it comes with 12-month warranty. • Very loud quality sound. • Very fast pairing process. • Extremely versatile, can be brought with just for any occasion. • Low-end response could be better. • No hook or wrist band for hanging up. • Portability issue due to its large size. JBL Flip 4 is the next generation in the award-winning Flip series that delivers surprisingly powerful stereo sound. It also features a built-in noise and echo cancelling speakerphone for crystal clear conference calls. 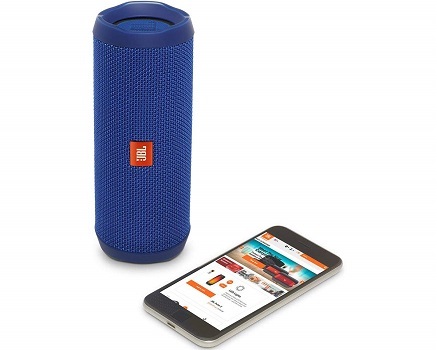 And with a simple button press, you can activate and talk to Siri or Google Now from your JBL Flip 4. To protect your investment it comes with 3-year warranty. • Small and easy to carry around. • The USB charging port feel flimsy. • Can pair with up to 100 other Flip 4s. • Crisp highs, detailed midranges and solid bass performance. • Solid audio performance with rich bass and well-defined highs. • Need a little bit more bass. • No track navigation buttons. 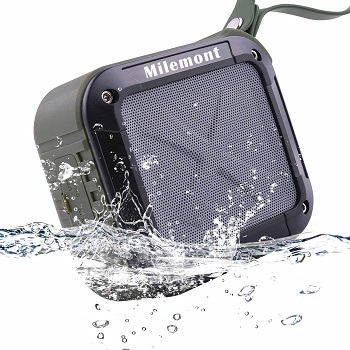 Milemont promises incredible sound quality from the kitchen to bathroom, from yard to swimming pool, or picnic to the beach. 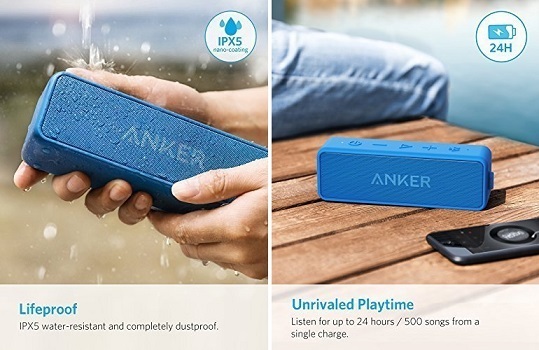 Its compact (fits easily into your pocket) and lightweight design (only 8.2 ounces) allow you to carry this waterproof Bluetooth speaker with ease. • Good tone and bass. • NFC technology for easy and instant connection. • Automatic shut down, after 15 minutes without any operation since you powered on. • Short playback time: 4-6 hours. • With AUX-IN jact, you can use it as an external speaker for your TV, mobile phone, etc. 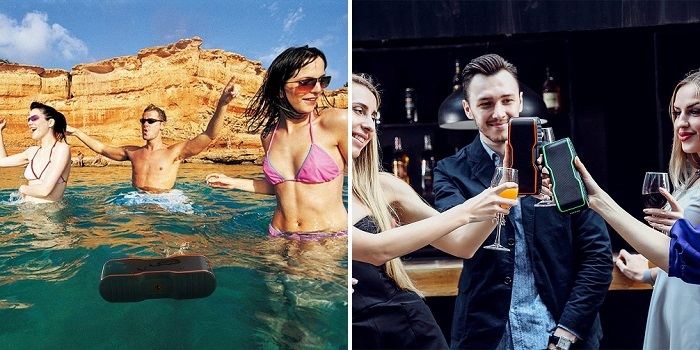 UE BOOM 2 Phantom blasts clean and loud, immersive 360-degree sound with powerful bass. 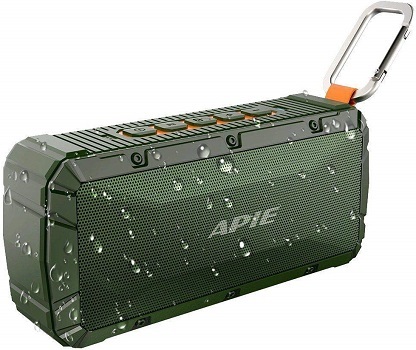 This Bluetooth speaker is specifically designed to get wet, muddy, and beat up. And with Siri + Google Now voice integration, you can enjoy a convenient voice command. • Fits in a vehicle cup holder. • Can pair multiple speakers. • Loud and doesn't "crackle" on high volume. • Very durable and is designed to handle a lot of impact. • Distorts at high volumes. Anker SoundCore 2 produces outstanding rich, clear sound with deep bass for up to 24-hours. 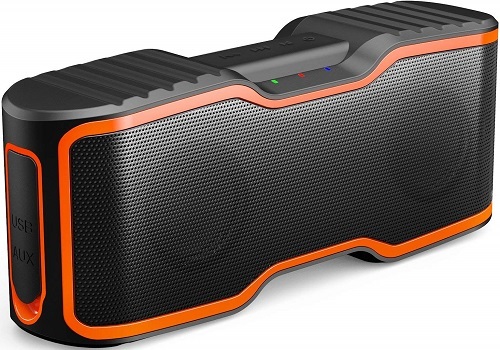 This water-resistant Bluetooth speaker can get pretty loud enough to fill up a small to medium size room with rich sound. To protect your investment it comes with 18-month warranty. • Pairing is a breeze. • USB out for charging devices. • Ability to enable voice activated software (Siri with iOS). • Can’t go to previous track. • Can’t call the last number dialed. • Mid-range becomes incoherent at higher volumes. • Exclusive BassUp™ technology and a patented spiral bass port boost low-end frequencies to make the beats hit even harder. APIE offers dual 10W drives providing an incredible full range of output stereo with impressive bass effects and clarity up to 10 hours anytime, anywhere. 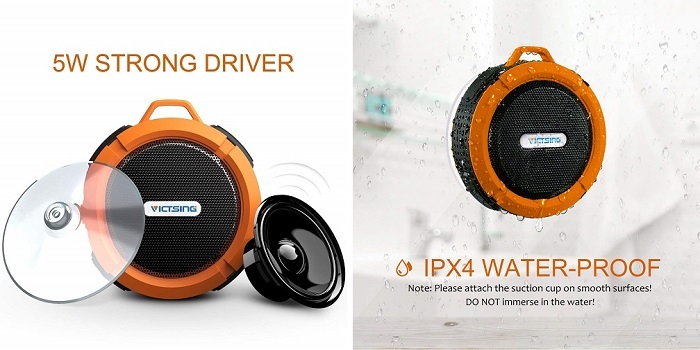 The speaker is water, shock, splash, and dust-proof, perfect for a small party in camping, pool parties and picnics, walking and more indoor or outdoor activities. • Easy to hook up to a backpack and carry. • Buttons are very stiff, hard to use. • Enjoy an impressively crystal clear sound quality and robust bass realized through dual high-performance drivers and passive subwoofer. AOMAIS GO with Bluetooth 4.2 easily connects to your tablets, cellphones in a snap. The sound performance is very crisp, clear and loud with a good deal of bass response for up to 30 hours. • Easily pairing Echo Dot anywhere in your home. • Buttons are bit hard to press. • Can`t pair when the aux-in jack is used. • Booming Bass and Full Volume: two 15 watt full-range drivers and two passive radiators. Super bass booms with less than 1% total harmonic distortion. 30W volume level.